AGIA (AIA, AUSTREGILDIS, AYE), the wife of St. Hidulf of Hainault (23rd June). She and St. Hidulf separated by mutual consent to enter monastic life. St. Agia entered an abbey in Mons where she lived until her repose circa 714. APOLLONIUS the APOLOGIST, a Roman senator and scholar who, after studies in pagan philosophy as well as the Scriptures converted to Christianity. Though during the time in which St. Apollonius flourished Christians were relatively free from persecution, when one of his servants denounced St. Apollonius to the authorities. St. Apollonius was then brought before a court which gave him the option of either renouncing Christianity or death, St. Apollonius refused to apostatize and was beheaded circa 190. Eusebius of Caesarea in his Ecclesiastical History , and St. Jerome (30th September) in De Viris Illustribus have written of St. Apollonius and his trial. BITHEUS and GENOCUS, (Sixth Century), Two British monks, who accompanied St. Finian of Clonard (12th December) to Ireland where they gained reputations for great sanctity and eventually reposed. There is no further information on either saint extant. CALOCERUS, (Date Uncertain), an officer in the army of the Emperor Hadrian who was martyred in Brescia for converting to Christianity. COGITOSUS, though little is known of this saint, it appears he was a monk at Kildare, and may very well be the author of Vita Sanctae Brigidae, the oldest extant Life of St. Brigid (1st February). Some sources assert that he may have been related to St. Brigid as well, though there is insufficient evidence to support this opinion. COREBUS, according to pious legend St. Corebus was a prefect in Messina, Sicily who was converted to Christ by the witness of St. Eleutherius (26th May). He was martyred (138) in the persecutions during the reign of Hadrian (r. 117 – 138). 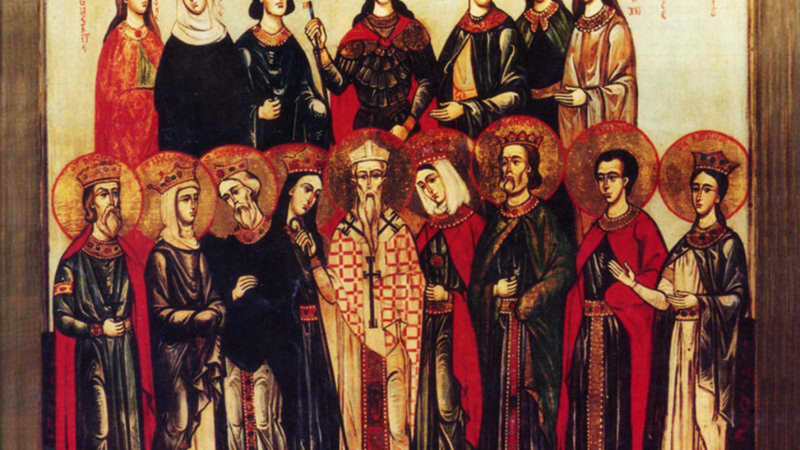 ELEUTHERIUS and ANTHIA, St. Eleutherius, Bishop of Illyria in present-day Croatia, his mother Anthia, and eleven others, whose name are no longer known, were martyred, possibly for their successful evangelisation, in Illyria circa 138, in the persecutions during the reign of Hadrian (r. 117 – 138). 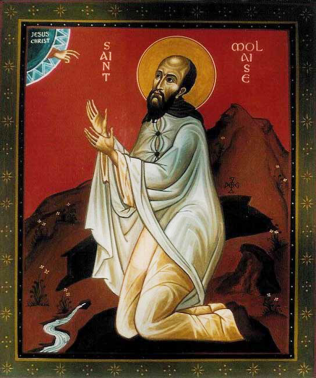 LASERIAN (MOLAISSE), A nephew of St. Blane (10th August), St. Laserian is said to have been ordained to the priesthood in Rome by Pope St. Gregory the Dialogist (3rd September). Upon returning to Ireland he founded the monastery and Bishopric of Leighlin, Co. Carlow, serving as the first Bishop-Abbot. Soon afterwards he was appointed Papal Legate, and, in that role, strenuously advocated for the Roman Practice to prevail, especially with regards to Easter (vide Paschal Controversy). St. Laserian is also venerated as the Patron of the Roman Catholic Diocese of Leighlin. PERFECTUS (PERFECTO), a priest in Cordoba who was martyred by Muslims for expressing the opinion that Jesus was the Son of God and our Saviour, while Mohammed was a false prophet. Following his arrest and conviction for blasphemy, St. Perfectus was executed on Easter Sunday 851. WICTERP (WIGBERT, WIHO, WICHO), Abbot of Ellwangen Abbey in Swabia (present-day Ellwangen an der Jagst, Baden-Württemberg). He also founded the pre-eminent monasteries at Füssen, Wessobrunn, and Kempten all in Bavaria. St. Wicterp was consecrated the twelfth Bishop of Augsburg circa 738, serving until his repose in 749.